Whether you're running a small business or a multi-million-dollar corporation, PTIOF of Bergen County encourages every office to save money wherever possible. Although saving money may be necessary, it’s important to plan wisely when budgeting for your new office furniture — some pieces are worth the splurge. Splurge:When it comes to the main desk in your reception area, choose a piece of furniture that’s going to make a statement. Your reception area will be your customers’ first impression of your business; it’s important to make it a good one. 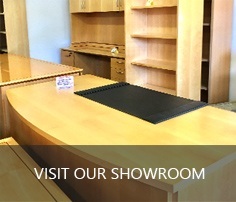 A great reception desk is welcoming and also sets the tone as soon as visitors step foot through your front door. Reception stations also need to withstand the high-traffic use that they’ll see, so do yourself a favor and go with a durable reception desk that’s going to last for many years. Save:Coffee and end tables are welcome accent pieces, but they don’t need to take up much of your budget. Occasional tables in a reception area are used very lightly, so selecting inexpensive options will not mean needing to replace the furniture the same way it would for a reception desk — when your coffee and end tables are ready for an update it won’t be such a blow to your budget. Splurge:Similar to reception desks, choosing the correct conference table is critical when creating a meeting space that’s attractive, impressive and comfortable, so splurge a little on your conference table of choice. Going with something sturdier and more resistant to high traffic use will ensure you won’t need to replace it anytime soon, which will actually save you money in the long run. In addition to picking the right table, choose conference chairs that are comfortable enough for users to sit in during long meetings. After all, nobody is going to be productive in a conference if their back is killing them. Splurge:Desks and office chairs in your business should be high-quality enough that they can withstand daily use and comfortable enough employees can work at them all day, every day. Providing employees with a standing-height desk option is becoming essential in today’s workforce, and offering an office chair with the right ergonomic adjustments will ensure employees are comfortable enough to stay productive all day. Save:Workstations are hugely important to the overall productivity and happiness of your employees, so the furniture you select for private offices and cubicles should be of the best quality you can afford. 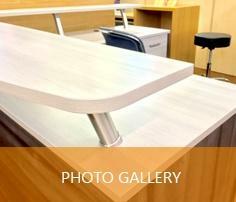 One thing you can save on, however, is the guest chairs employees keep at their workstations for visitors to use. Whether it’s side chairs in a corner office or a task chair in a cubicle, these chairs are used very lightly and therefore don’t need to be able to withstand any harsh wear the way the employee’s ergonomic chair needs to. Save:The right décor can create a place that inspires creativity and relaxation in your employees. That being said, there are tons of budget-friendly décor and accessory options to choose from when designing your office. Select all the important furniture first and choose your décor based on the budget you have left over. No matter what the budget is, you’ll find a selection of artwork, lamps and area rugs to fit into it. Spend vs. splurgeWhen determining where to spend vs. where to save, it boils down to this: Invest in the focal point of a room, such as the reception desk, conference tables and the high-usage areas. Save on the extras that round out your space. With that in mind, take a step back and determine where it makes the most sense for your office to spend and where to save.